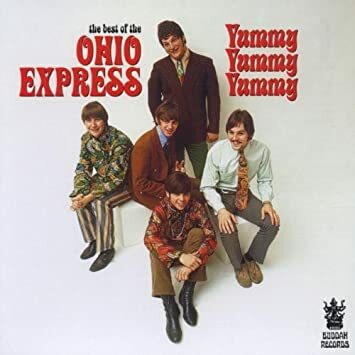 Han’s Worst Hits of the 60’s- today takes aim at “Yummy, Yummy, Yummy”- by Ohio Express. In thinking about it I would rank this even worse than yesterday’s Sugar, Sugar- by The Archies. “Sugar, Sugar” was awful but OK I will admit it was a catchy song- “Yummy, Yummy, Yummy” is not only an awful song but irritating especially the singer Joey Levine’s voice. “Yummy, Yummy, Yummy” made it to #4 on the Billboard Hot 100 in 1968. The Ohio Express were actually a group of studio musicians working out of New York. They would have a total of 5ive Top 40 hits- the only one I have heard is this one. Good one, hehe. These are the kind of songs I loved as a toddler. They are almost novelty songs, imo. Very fun and catchy though. Today I always think of the musicians, and wonder if they were capable of greater things but steered in the wrong direction by an enterprising label or agent. I could see kids liking this kind of song no question. You are right…this one is worse than the other…I’m not mentioning the other by name…and it’s not as catchy thankfully. His voice… is one of the most irritating voices I’ve ever heard. I agree with everything you are saying!! I’m ok with this one. I’d have been six when it came out. I can’t remember ever seeing the promo film before (they look so young) – but then there were precious few places to see them anyway. The primary place was ‘Top of the Pops’ on Thursday evenings. The funny thing is the ‘deeper meanings’ some people ascribe to the lyrics. I feel like an *era-ist* by hating their clothes as much as I do. I’m sure people will look back one day and remark on how idiotic our clothes are now. But their clothes make me want to open a bottle of Jack and take a long, deep swallow.